-Combine oats and buttermilk in a medium mixing bowl and let stand. -Combine the first five dry ingredients in a large mixing bowl, stir well. -Add the eggs and melted margarine to the oat mixture and mix well. Add this to the dry ingredients stirring just until moistened. Do not over-mix! -Gently fold in the blueberries. -Line or grease 10 to 12 muffin cups and fill 2/3 full with the mixture. -Bake at 375 F (190 C) for 20 to 25 minutes until the top springs back when lightly touched. You can sour regular milk to use in place of buttermilk. Put 1 tbsp of lemon juice in a 1 cup measuring cup. Add milk to make 1 cup. Let stand for 5 min, then stir and use in recipe. When a recipe calls for folding in an ingredient it is to prevent the batter from becoming over mixed which can result in a tough muffin. To fold, sprinkle the blueberries over the batter. Next, cut down through the centre of the batter with a rubber spatula. Draw the spatula across the bottom and up the side of the bowl, folding the batter over the blueberries. Give the bowl a quarter turn and do it again. Repeat just until the blueberries are distributed through the batter. Darlene has had a passion for cooking her whole life. She has worked in the restaurant industry for many years including owning her own restaurant, Darlene’s Tea House in Blackville. 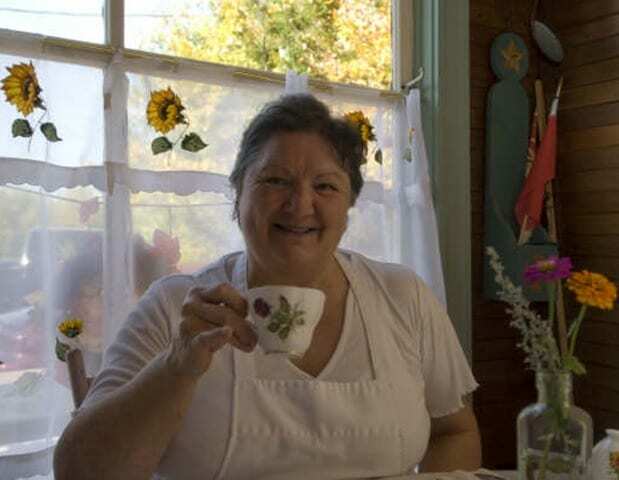 She currently has renovated the Tea House into a rustic cottage getaway, for rent to guests in the summer (www.DarlenesVintageCottage.com). In her spare time she volunteers at the Greater Blackville Resource Centre. She may be reached at 506-843-7878.